Some people in the family were not at all pleased to learn about George Cockram's desertion from the Royal Marines. It is a little disappointing to be descended from a deserter, and I guess we all feel just a bit betrayed - we thought George was a fine upstanding kind of guy! But when you (I should say 'I') go rummaging around in ancestral closets, skeletons will be found. Just because we don't like something our great grandfather did, well, too bad for us - he's still our great grandfather, the man who did all the GOOD things we already know about. If you're one of the above people, stay tuned, because I have a bit of information that might make you feel better... and another bit that might make you feel worse. After two or three years in the Royal Marines, George was thinking he'd made a mistake in joining up. A Marine Private's life was really pretty boring, with a lot of drill, weapons training, trivial work, polishing boots and buttons, kit inspections, being bawled at all day by NCOs who thought they were better than you, and not a whole lot of actual time at sea. And when he was at sea, it was a dull life, guarding the ship's officers, keeping the sailors in line and always having to carry a big gun around. There was no fighting going on, just sailing around reminding the British colonies who was boss. It all seemed quite pointless, really. Then one day when he was on leave in Plymouth, he met a lovely Cornish lass called Louisa Murphy, and he was smitten. Pretty soon they were making plans - they'd get married and go to Canada, get some cheap land there and spend their lives farming and raising lots of children. So in 1875 they got married, and Louisa got pregnant (but I'm pretty sure those things happened in the other order), and could hardly wait to start their new lives in Canada. It was all so tempting, George began to realize that he couldn't possibly wait until the end of his service - another 8 years! Especially now that he was going to become a father - he wanted to raise his children in a big new country with lots of opportunities, not dreary old England, where the class system would always keep them down. You could say that George was a hero for doing what was best for his wife and family, rather than for Queen Victoria and the British Empire. And he did all of his descendants a favour too. So, with great trepidation and guilt in his heart, he and Louisa made plans for his sudden disappearance. Louisa didn't want to disappear with him just then, and have her first baby in a strange country, perhaps in the middle of nowhere, without her mother. So George would go to Canada alone, to check things out and find a home for them, and Louisa and the new baby would go later. George bought a ticket for the SS Dominion, sailing from Liverpool on the 10th of June, and checked the Bradshaw's* to figure out what trains would get him to Liverpool. It would be about a 14 hour train trip, at best. 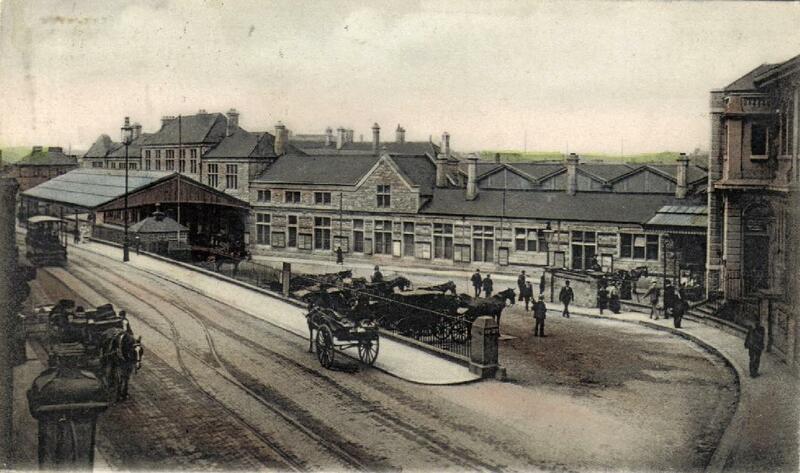 Then, on the 8th of June when he was ashore in Plymouth, he met Louisa at the train station. He didn't dare go home, where he might be apprehended. Louisa had brought a quick change of clothes for him and a suitcase for his journey. They kissed goodbye, and off he went on a daring adventure, afraid of being caught and feeling very guilty, but looking forward to his new life as Thomas Smith. Well, it could have been something like that. By the way, at that time, desertion wasn't a terribly serious offense, mainly because England wasn't at war. If George had been caught, his punishment would have been anything up to 3 months in prison, possibly with hard labour and/or solitary confinement. And if he was turned in by a private citizen within a month of his disappearance, that person would have been awarded a bounty of 3 pounds. The bounty grew less as time went on, and after a year, the RM didn't care if he was found or not. Now here's the thing that might make you feel worse - it could have been possible for George to BUY his discharge from the Marines, rather than deserting. But it would have cost him 18 pounds, nearly a year's pay, and there was no guarantee that his wish would be granted - it would be up to his commanding officer, after 30 days of thinking it over, to decide to let him go or not. And this brings up another point - maybe George DID apply to buy his way out, and was refused, which made desertion a last resort. Does that make you feel any better? And here's the other thing that might help - and it's another mystery. George's record in the Royal Marines Service Register says that he was granted a 'protection certificate', which more or less absolved him and guaranteed that he would never be required to finish his service in the Marines. But the certificate was issued in 1887, 12 years after he left! My friendly researcher at UK Forces War Records says this means that he must have turned himself in shortly before that time. But as far as I can tell, once he left England, he only returned twice - in 1876 and in 1911. So perhaps he turned himself in by post in 1887, if that was possible - I'm checking that. But regardless of how and when he turned himself in, it goes to show that he carried a load of guilt with him for some time, and eventually couldn't stand the weight of it anymore and had to do the right thing. He was, after all, a good and honourable man.